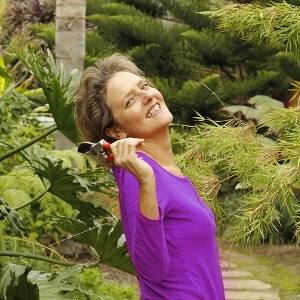 Planning a desert or drought tolerant garden? Here are 127 stunning desert plants & succulents that'll look gorgeous in your garden. You'll find lots of photos too! From the colorful Paddle Plant, to the adorable Burro’s Tail, desert plants of all shapes and sizes can be found everywhere these days. Many succulents can be planted just about anywhere, from crafty DIY terrariums to exotic desert gardens. 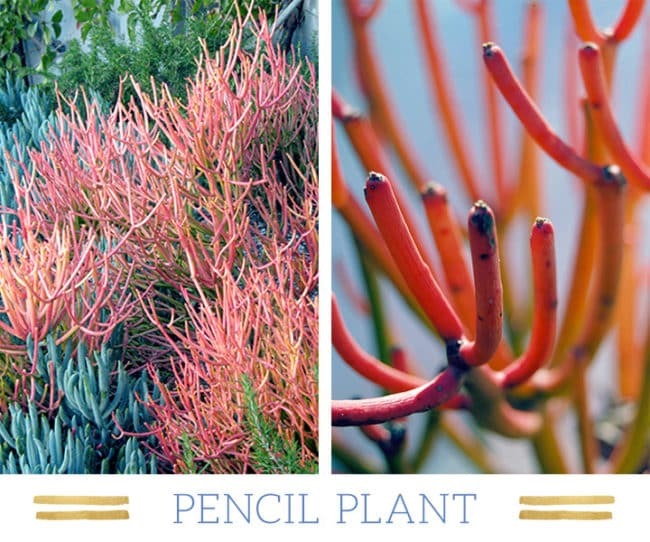 They’re low maintenance, drought-tolerant, and are available in a variety of shapes and sizes, making them incredibly easy to incorporate into your home decor. To help you identify your favorite desert plants, FTD created a visual compendium of 127 of the most stunning desert plants and succulents. 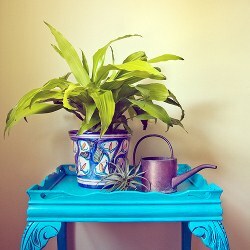 It features real photo examples so that you can easily choose the best plants for your home and garden. Checkout the compendium below, you’ll be sure to discover a few exotic species that you’ve never seen before! Desert plants have found a place in modern home and garden design. There are many plants in the desert that can survive in a xeriscape garden or even in a glass terrarium. The term xeriscape is derived from the Greek word xeros, which means “dry,” and is a form of landscaping that conserves water through the use of native plants. Thus, desert plants have become popular for landscaping because they are easy to take care of due to their drought-tolerant capabilities. Popular desert plants include the Palo Verde tree, the Queen Victoria agave, the golden poppy, and the Mexican thread grass. To help you identify the many desert plants there are, we created a compendium below of 127 of the most stunning desert plants and succulents. Desert plants can be classified into three main categories: Cacti and Succulents, Wildflowers, and Trees, Shrubs, and Grasses. For each category, we’ve compiled a helpful desert plants list that outlines the most popular plants within that category. Did you know that all cacti are succulents, but not all succulents are cacti? Desert succulents, including cacti, are the modern gardener’s best friends. Due to their ease of care, and wide variety of shapes, sizes, and colors, the options for designing your home and garden with these trendy plants are endless. From terrariums to your garden, it seems that you can grow succulents almost anywhere. As long as you provide these drought-tolerant plants with good drainage, sandy soil, and sunshine, they will thrive for years. 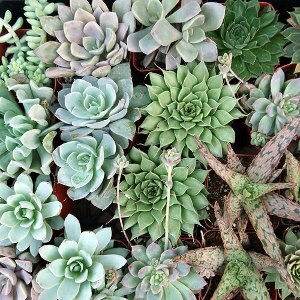 From the popular ghost plant, to the architectural marvel of the crassula plant, there are so many varieties to choose from. To help you narrow down the many succulents choices that are out there, we’ve picked the top 10 most popular for your home and garden. 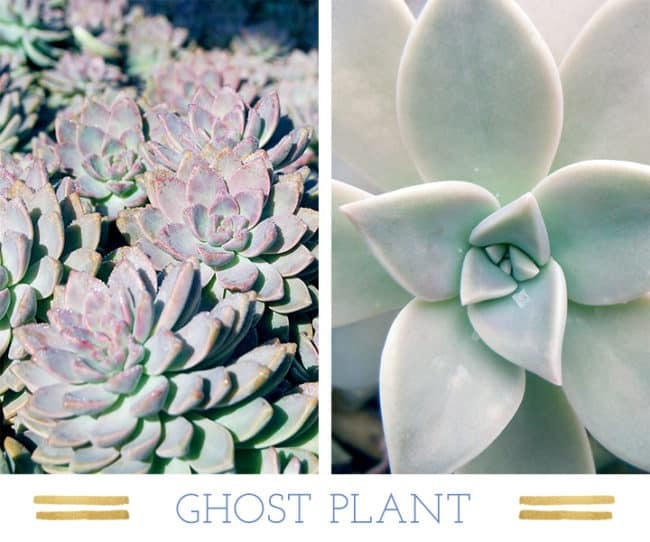 The ghost plant is probably one of the most popular succulent plants used today. Chances are, you’ve seen it in the succulent gardens and indoor terrariums that have become so popular in landscape and home decor. Also known by its scientific name as Graptopetalum paraguayense, it is one of the easiest succulent plants to take care of. Depending on the level of sunlight it receives, these plants can take on various colors ranging from blue-gray to pinkish yellow. When new rosettes form at the tips of its stems, its old leaves fall off. During springtime you can witness the ghost plant producing bright yellow flowers. A popular choice amongst modern landscapers, these succulents are widely used in drought-tolerant landscaping, or xeriscaping. Also known as Euphorbia tirucalli, the plant’s green pencil-like sticks turn bright coral when the plant is under stress. 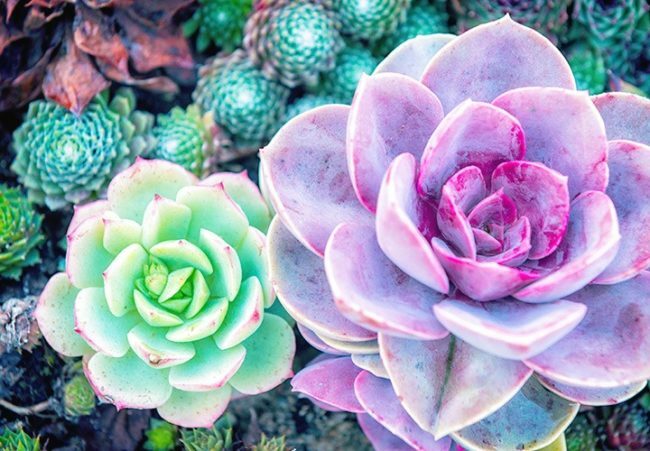 Succulent stress can come in the form of many factors including the plant having too little water, being too cold, or being planted in nutrient poor soil. Gardeners commonly deprive this succulent, as well as several other types of succulents, of nutrients or water on purpose in order to encourage the plant to display its bright and showy colors. 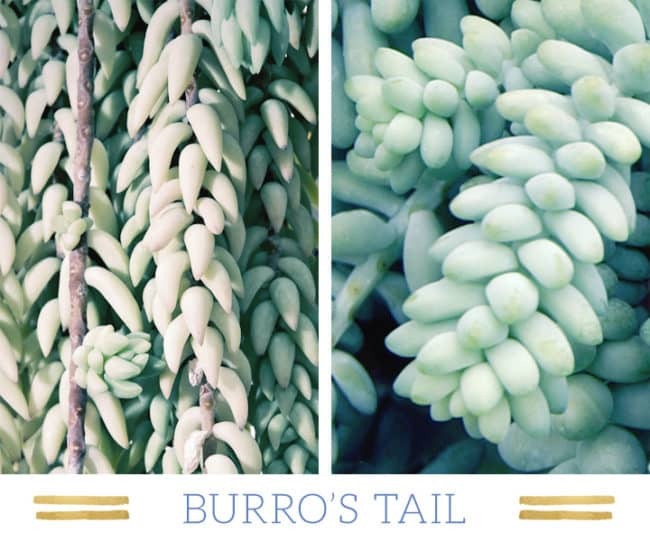 Popular as a house plant, the Burro’s Tail succulent, bears long stems that are plaited with tear-dropped shaped leaves. They are popular for planting in hanging baskets, which allow the long stems to drape to the ground. Colors range from green to blue green, with an ashy finish that gives the colors a muted tone. Place your Burro’s Tail out of direct sunlight, as the leaves will burn. Partial sun, or brightly-lit shade is best. 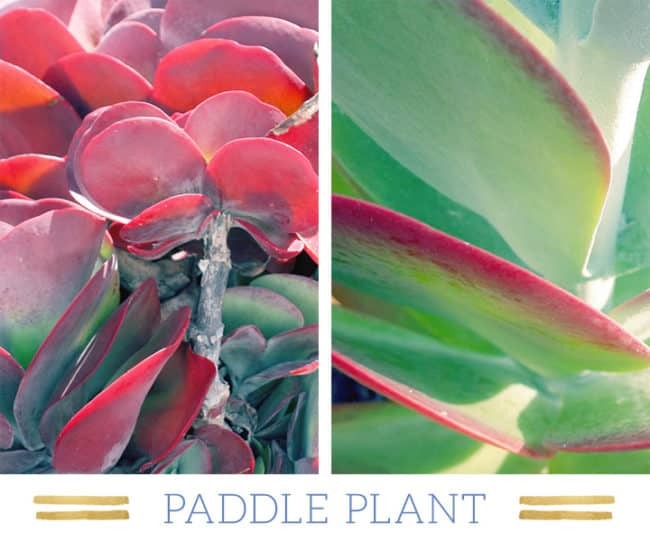 Also known as red pancakes, the paddle plant’s funny nickname is derived from its large, bright red, disk-shaped leaves. They make a striking addition to any xeriscape garden and thrive in hardiness zones 9 to 11. When mature, the paddle plant forms a single flowering stalk from its center. Like many other succulents, the paddle plant is a monocarpic plant, which means that the plant will sprout a flower when it is about to reach the end of its lifecycle. However, there’s good news — to preserve your paddle plant, simply snip off the stalk and replant! 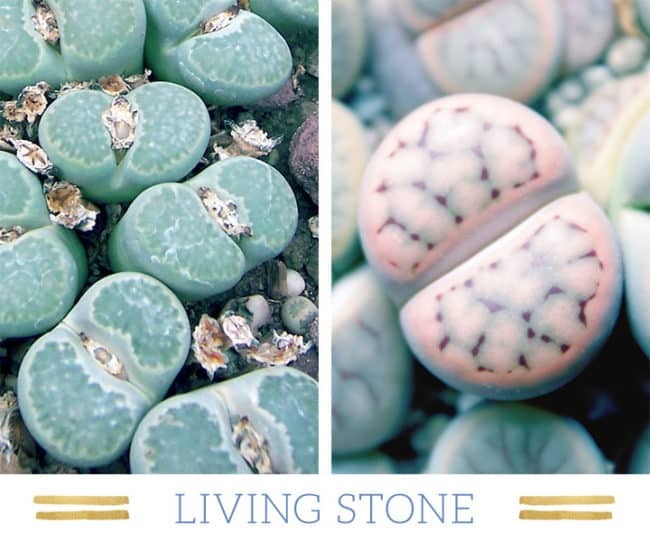 Living stones, known as lithops, are a prime example of evolution at its best. These succulents have evolved to seamlessly blend into their surroundings, and protect themselves from predators. Upon first glance, they look just like small stones or pebbles. However, upon closer examination, these stones are actually living plants. Originating in southern Africa, where they receive less than 2 inches of rainwater a year, these plants are well adapted to dry climates. The extreme climate conditions cause the plant’s formation to be stripped down to just two leaves, which are fused together at its base where the root holds them together. This formation evolved from the plant’s need to have the least amount of surface area exposed to the hot sun. The thick stone-shaped leaves also allow the plant to store as much water as possible. A direct product of evolution, this is truly a fascinating plant to have in your succulent collection! The marble-like striations on the petals of this agave make it a favorite amongst modern landscapers. Scientifically known as Agave victoria-reginae, this agave is native to the Chihuahuan desert of Mexico. It is extremely drought-tolerant and thrives in hardiness zone 7. Shaped like a large rosette, it has a very distinguishing look that’s similar to an artichoke. The spherical arrangement of the leaves allow it to funnel water down towards its root base. 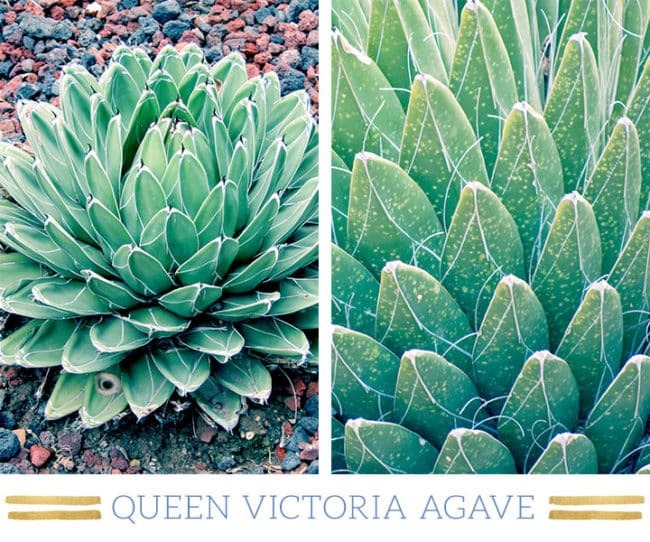 In the wild, the Queen Victoria agave can live up to 15 years. This incredibly slow-growing plant is often compared to aloe. Its contrasting white striations against its dark green leaves makes it a popular houseplant and a trendy way to decorate your home or even office desk. 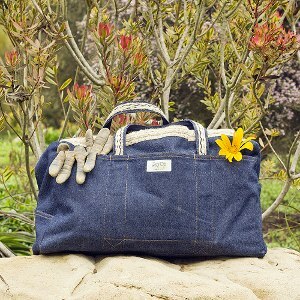 It is easy to maintain, but keep it away from direct sunlight or deep shade. 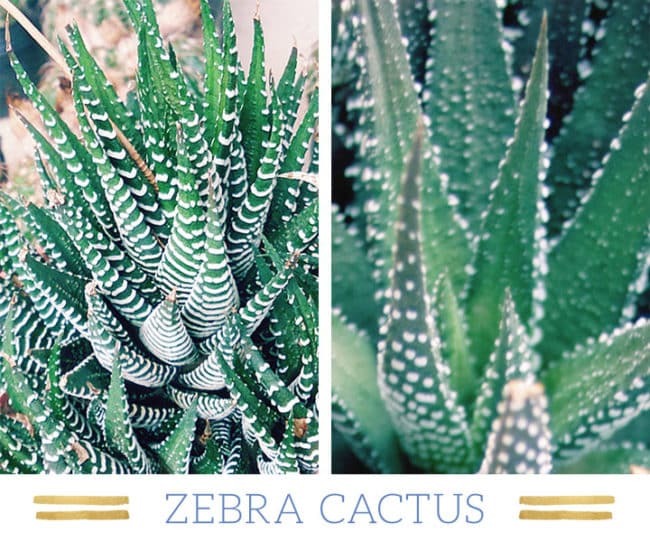 It only needs watering about once a month, and if you’re lucky, the Zebra cactus will flower during the summer if given the proper living conditions throughout the year. The Golden Barrel cactus is fittingly named for its large, bulbous shape. Adorned with golden yellow spines, this cactus makes for quite a striking centerpiece in any desert landscape — both in the wild and in your garden! The top of the barrel cactus is where its striking flowers bloom. Once pollinated, it closes up and the seeds begin to develop into fruit, which sit on top of the cactus until pulled out. 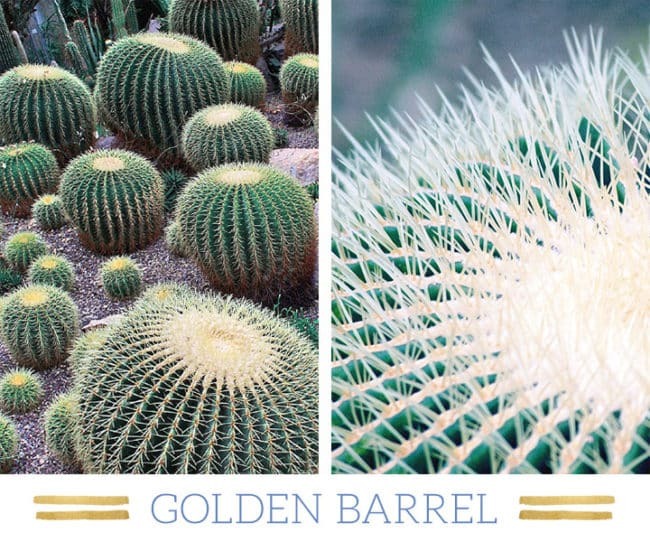 The Golden Barrel cactus is known for being slow-growing and can live for quite a long time. 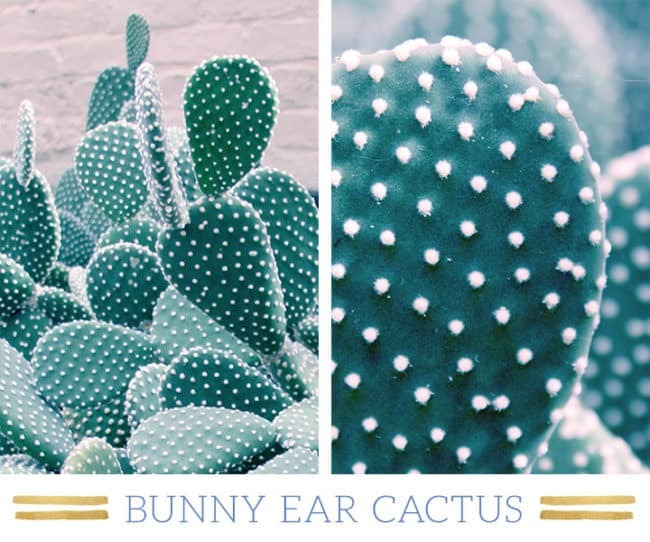 Believe it or not, the Bunny Ear cactus is actually a type of prickly pear cactus. Upon first glance, it may seem that this cactus does not contain any spines. However, if you look closely, the fuzzy specks that adorn this cactus are actually small clusters of tiny little spines. These types of cactus spines are called glochids, and are nearly impossible to remove if caught in your clothing or skin. Bunny Ear cacti are available in both yellow and white spine varieties. Also known as Agave attenuata, this agave is commonly found in desert gardens and is a popular choice amongst landscapers. 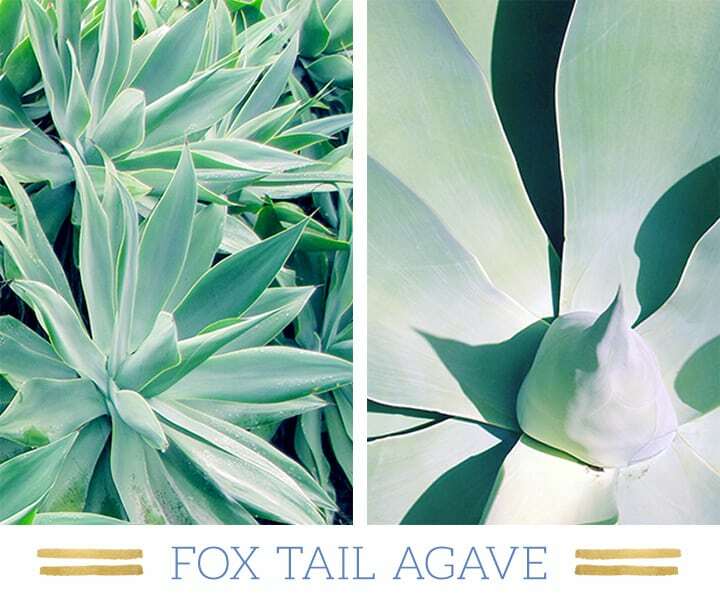 The fox tail agave has a centrally curved spear, from which large green leaves emerge and curve back, resulting in a shape that looks like a large green flower. Its leaves are smooth and pliable, and unlike its other agave cousins, the leaves are completely spineless — making it a safe choice for planting in gardens. Desert wildflowers provide a refreshing pop of color in the dry desert landscape. Although they have adapted to survive in such harsh climates, their bloom cycles are extremely sensitive and dependent on a variety of factors including frequency of rainfall during winter, moderate temperatures, wind, and elevation. Botanists refer to wildflowers as “ephemerals”, meaning that they have extremely short life cycles and will only grow under the right conditions. Once the flowers bloom, they will quickly spread their seeds and a sea of colorful blooms will grow for a short period of time before the plants die. In general, wildflowers are known to start flowering in early spring from February to March. Although most desert wildflowers are known to be only found in their natural habitat, there are still many species that can be adapted for the domestic garden. Popular garden wildflowers include the California poppy, the desert sage, and the winecup. 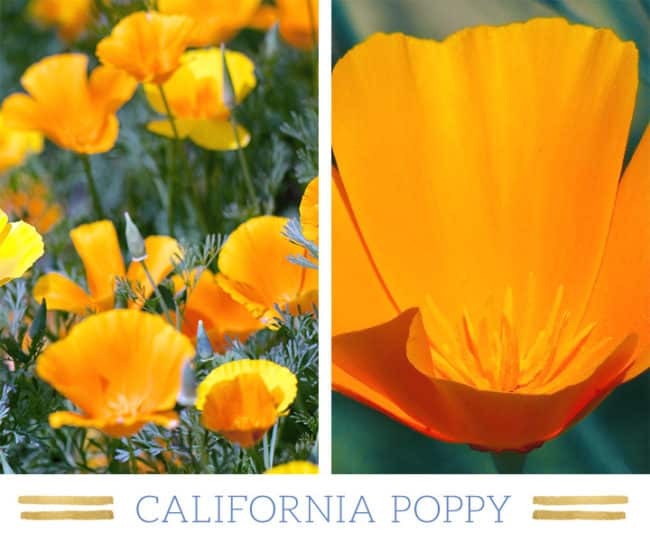 As the official state flower of California, this poppy is known for it’s bright orange color. It is native to the western region of the United States, from the coast of Oregon down to Baja California. Due to its popularity and how easy it is to grow, the California poppy can be found in most states in gardens, roadsides, and even empty lots. The petals of this dicot open during the day and close at night. will bloom all summer in California and in cooler coastal climates. In hotter summer regions, the flowers will die after blooming in early spring, and the plant will remain dormant for the remainder of the summer. Like the poppy, this drought-tolerant wildflower will open in the morning and close in the evening. 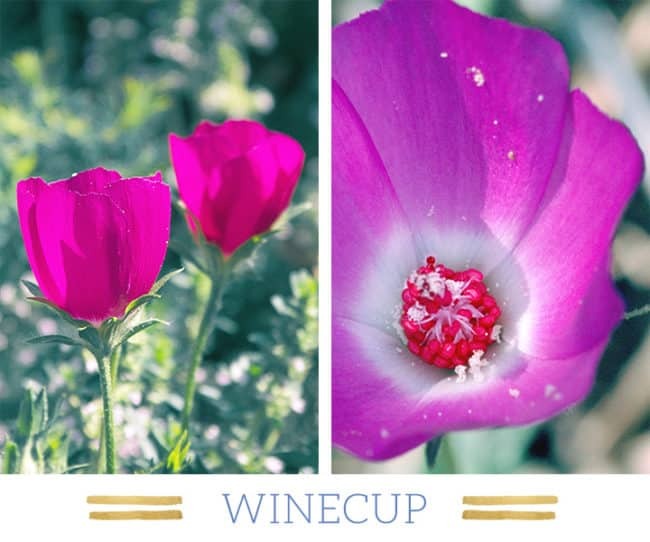 The Winecup is a perennial that bears cup-shaped flowers that range in color from light pink to deep magenta. This wildflower will bloom from March to June and thrives in sandy or rocky soil that is well-drained. Outside of the wild, it is popularly used as a bedding plant, or for hanging baskets where its long stems can cascade over the side. One interesting fact about this plant is that it it can be medicinally used as a natural pain reliever. 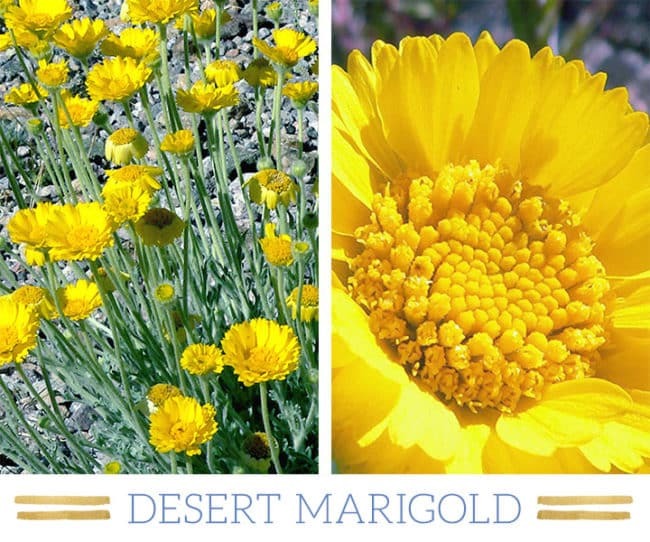 The name marigold can be derived from its early association with the Virgin Mary, when this golden flower was deemed as “Mary’s Gold.” The desert marigold is native to the southwestern desert areas of the United States. Its long bloom time occurs from March until November, and the it can often be seen on roadsides where it covers the landscape in a thick yellow blanket. It is common to see flowering buds sealed into a hard ball. This is the result of the symbiotic relationship between the desert marigold and the desert marigold moth larvae, which envelops the flower into a cocoon. 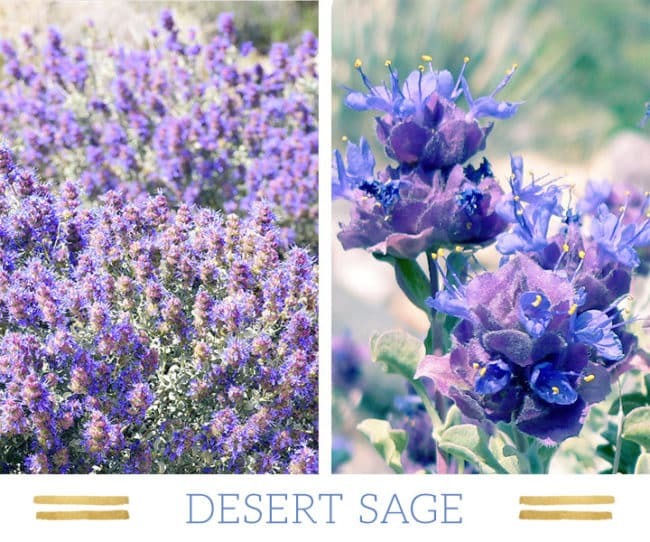 The desert sage is one of the most beautiful desert wildflowers. With its bold blue and purple flowers and frosty gray foliage, these wildflowers truly standout in any desert landscape. Desert sage can thrive in high heat, nutrient-poor soil, and require little watering. Because of these factors, the desert sage is not fitting for fertile soil within most garden settings. However, it is the perfect addition to a xeriscape or drought-tolerant desert garden, because it is great for attracting birds and butterflies. The whitestem paperflower is named for its delicate flower petals which dry into paper once the flower dies. Belonging to the same family as the daisy, this flower blooms nearly all year long from spring to fall, and thrives in hardiness zones 8-11. Its bright yellow flowers have five petals, and its stems can grow up to 12 inches tall. 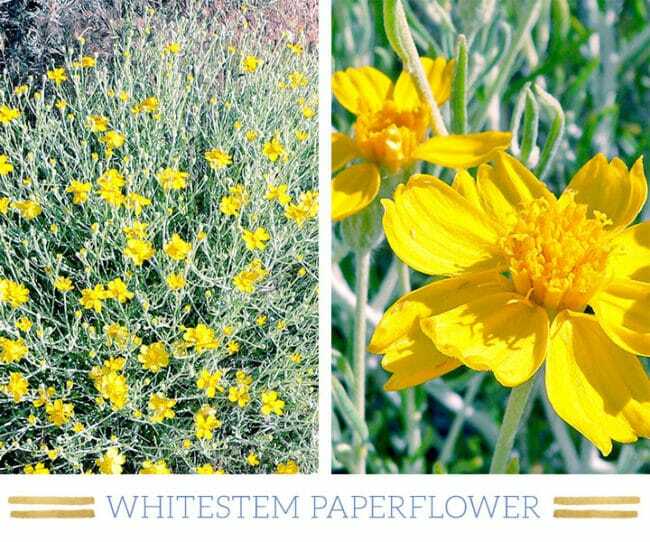 The whitestem paperflower is native to the southwestern United States and can be found in Southern California, Nevada, Utah, and New Mexico all the way to northern Mexico. Beyond cacti, succulents, and wildflowers, the rest of the desert landscape is inhabited by trees, shrubs, and grasses. Like cacti and succulents, this subgroup of desert plants does not require much care and tends to be slow-growing. From the green Palo Verde tree, to the flowering ocotillo shrub, many of these plants are popular choices for desert garden landscapes. Trees play a very important role in the desert, as they are one of the tallest plant species and provide necessary shade and protection for other desert plants. It is amazing to see how such large trees have evolved to survive in the desert, with some species that can live for over 100 years! Shrubs and grasses are suited to withstand the harsh dry winds of the desert, with some shrubs that can grow into the size of trees. Here we’ve outlined the top 5 most popular desert trees, shrubs, and grasses. This popular desert tree is known for its striking green trunk and bright yellow flowers. The green trunk is due to the presence of chlorophyll. Because there is so much chlorophyll in the trunk, much of the tree’s photosynthesis occurs there. 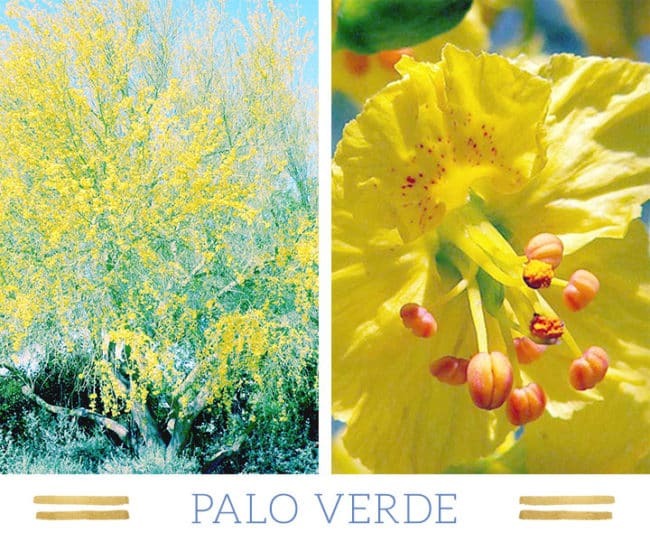 There are two common types of Palo Verde trees, the Blue Palo Verde, which has a blue-green trunk, and the Foothills Palo Verde, which has a yellow-green trunk. The Palo Verde is the “nurse” plant of the Saguaro cactus, as the two species are often found inhabiting the same areas. In the wild desert, the tree plays a key role in the procreation of new plant life as it provides necessary shade and protection for young Saguaro cacti and other vulnerable desert plants to grow. In a garden setting, the majestic Palo Verde makes for a striking focal point and is a popular choice amongst xeriscape landscapers. 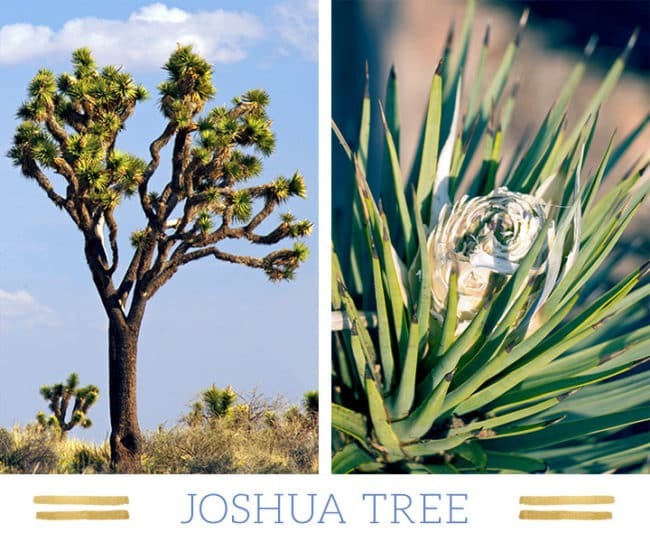 The Joshua tree is the largest of the yucca species, and is scientifically known as Yucca brevifolia. This tree is so rare that it only grows in the Mojave desert. One reason for its scarcity is that it completely relies on the female pronuba moth for survival. In fact, this symbiotic relationship has caused the moth to evolve specialized organs to help collect and distribute the Joshua tree’s pollen as it travels from tree to tree. The female moth lays its eggs in the Joshua tree’s flowers where the hatched larvae eat the seeds to survive. This fascinating tree is extremely slow-growing, and only grows about 2-3 inches a year. It can take up to 60 years for a Joshua tree to mature, and it can live up to 150 years. 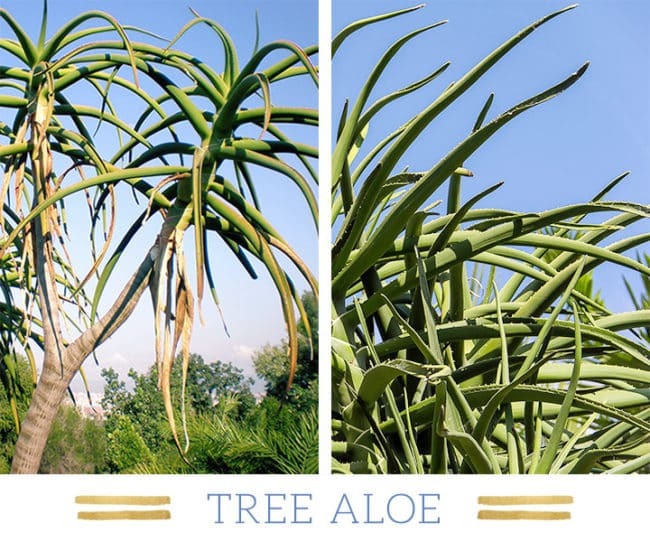 The tree aloe is native to Africa, where it is the continent’s largest species of aloe. Its dark green leaves form dense rosettes, with tips that curve and are lined with sharp teeth. Also known as Aloe barberae, the tree blooms in June and July and bears pink flowers. Unlike many common desert trees, the tree aloe is fast-growing. When tree aloe is planted in a garden, it should have ample space and be planted away from nearby buildings. 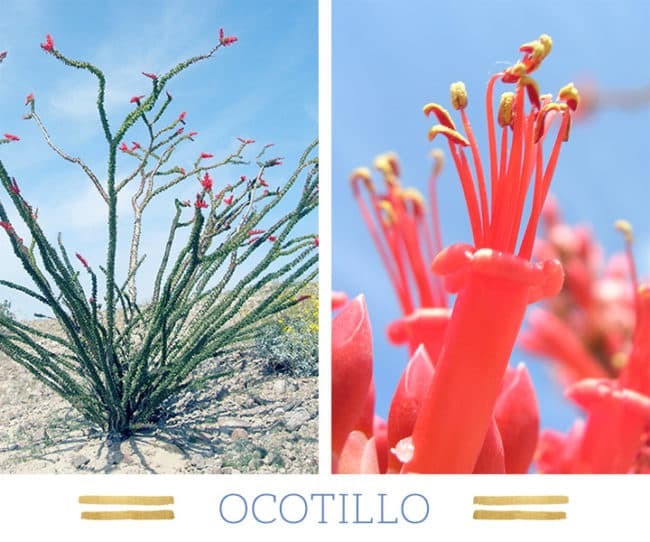 The ocotillo is a common desert shrub that bears striking red tubular-shaped flowers from its spiny, leaf-covered stem. Its sharply-toothed stem makes this shrub a popular choice as fencing in the garden. This shrub is native to the Sonoran desert where it prefers rocky terrain. Its bloom time occurs from March to June. Also known as Candlewood, the ocotillo can live a long life of 60 years, with studies suggesting that some can live well over 100 years. This perennial bears long thread-like leaves that feather at the ends. The leaves sprout from a middle base from which they cascade outward and downward. 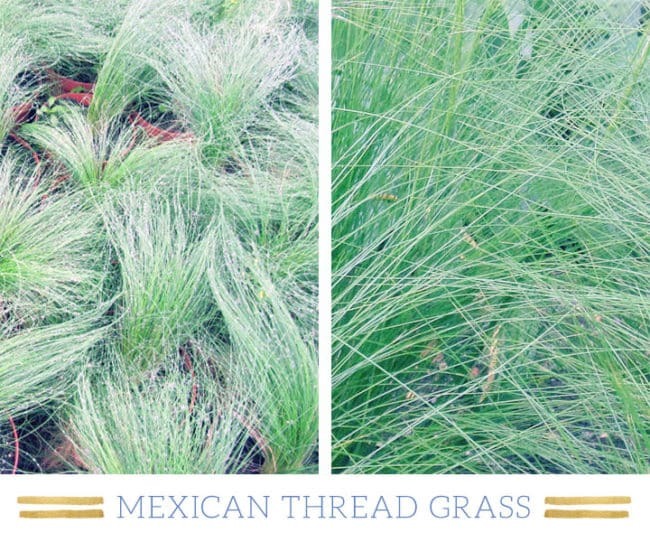 The Mexican thread grass is a popular choice amongst landscapers not only for its drought-tolerance, but for its tendency to be naturally pest free. It can be used as a border or as ground cover, and although it does reseed it isn’t aggressive and will not invade the garden. The Mexican thread grass will sprout new leaves in the spring. In the summer, if deprived too much of water, the grass may enter a dormant stage and continue its growth once temperatures cool down. With so many desert plants to choose from it can be difficult to identify which ones are the best for your home and garden. To show you the many desert plants that exist, we’ve created a compendium featuring 127 of the most popular desert plants. So the next time you see that adorable succulent or unique cactus, you’ll definitely be able to identify it! Thanks FTD! Here’s a list of all the resources and image sources in this post. 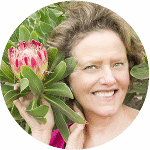 This is one of the best sites I have seen for plant identification made easy! I have now discovered some beautiful plants that I could add to my new garden in Almeria. We have been in Spain only 6 months and the garden needs colour as we have a lot of palms. Thank you for helping me choose the right plants! I live in Waco Texas and most of my beds are in full son and get pretty warm in the summer. Do you have any ideas on plants I could source locally the are good in high heat and with neutral colors perhaps?